Apple on Friday released a minor update for the OS X version of iTunes, adding enhanced classical music listening options for the company's streaming Apple Music service that bring it in line with Music on iOS. 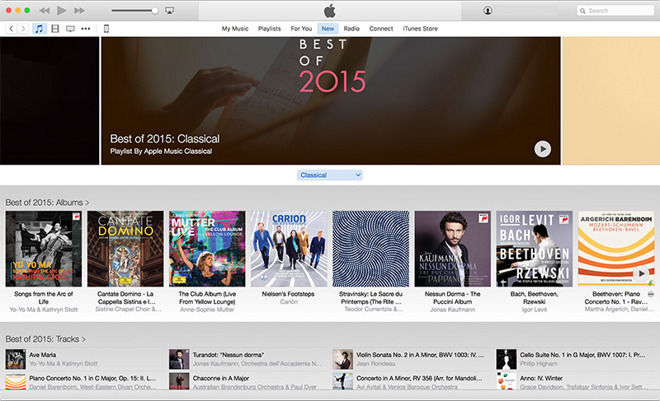 According to the release notes, iTunes version 12.3.2 lets Mac owners running OS X 10.11 El Capitan browse the classical music Apple Music category by work, composer and performer. The update also comes with the usual assortment of unnamed bug fixes and performance improvements. Today's changes brings iTunes in line with the latest version of Music on iOS, which was released on Tuesday as part of Apple's iOS 9.2 update. Music in iOS 9.2 was likewise updated to incorporate features previously seen on Mac, such as improved iCloud Music Library track handling. Mac users can download iTunes version 12.3.2 via the Mac App Store.